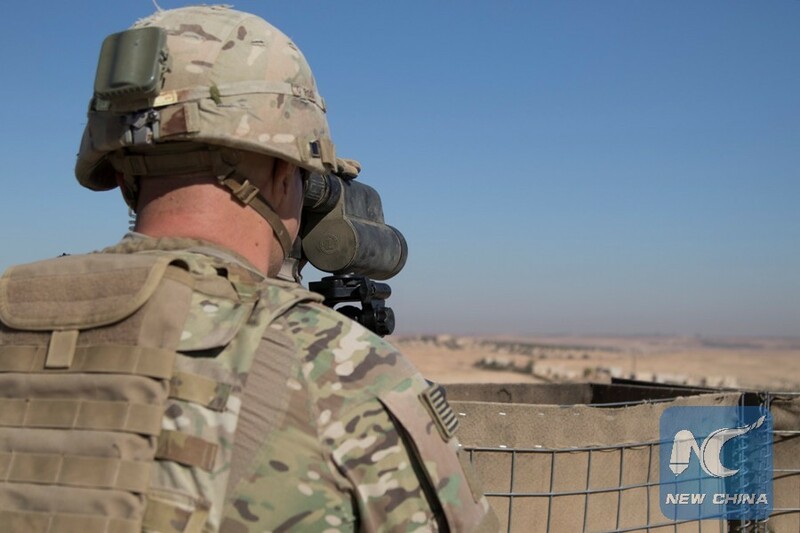 WASHINGTON, Jan. 16 (Xinhua) -- A number of U.S. soldiers were killed in a blast on Wednesday while conducting a routine patrol in northern Syria, the U.S. military said, the first U.S. casualties since President Donald Trump announced his plan to pull out of troops from the country. "U.S. service members were killed during an explosion while conducting a routine patrol in Syria today. We are still gathering information and will share additional details at a later time," Operation Inherent Resolve, the U.S.-led coalition against the Islamic State, said on Twitter. The Islamic State claimed responsibility for the suicide bombing that targeted a U.S. patrol in Syria's Kurdish-controlled city of Manbij in the northeastern countryside of Aleppo province. Four U.S. soldiers were killed and three others wounded in the Manbij explosion attack, media reported citing a U.S. official. A suicide bomber detonated his vest filled with explosives near a restaurant in Manbij near a patrol of the U.S.-led coalition in that city, according to the Syrian Observatory for Human Rights. The monitor group said the bombing was the first of its kind to hit Manbij in terms of targeting a convoy of the U.S.-led coalition in the city. The rare attack came days after the United States began the process of withdrawing from Syria, having reportedly pulled out ground equipment from the northeast into Iraq. Currently, there are about 2,000 U.S. troops deployed in Syria. Last month, Trump abruptly announced his decision to withdraw U.S. troops from Syria, citing that the Islamic State has been largely defeated. White House Press Secretary Sarah Sanders told media Wednesday that President Trump had been "fully briefed and we will continue to monitor the ongoing situation in Syria." Manbij is controlled by the Kurdish-led Manbij Military Council and U.S. forces patrol the city after tension grew between the Turkey-backed rebels around Manbij and the Kurdish-led militia inside the city.